October is a month of crashes. One of the biggest market crashes took place 25 years ago today. 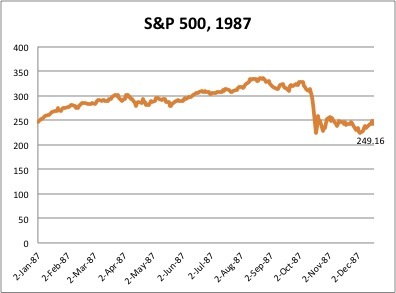 After gradually increasing some 20% in 1987 through the end of September, the S&P 500 began to fall in early October, and then plunged on October 19th. Black Monday. From a high of 336 in August, it dropped to 224 on this day. That’s a fall of one-third from peak to bottom. In one day, it fell 22%, from 282 on Friday, October 16 to 224 at the end of Monday, October 19.
f you had $100,000 in the C Fund at the peak of the market bubble and this happened, your $100,000 would have fallen to about $66,000 from peak to trough (assuming no additional contributions). If you had $100,000 in the C Fund the day before the market dive, you would have had about $78,000 at the end of Monday. A reduction of $22,000 in one day! How would you have reacted? The question for TSP investors is, will this happen again? Just as there was a crash five years ago, I’m sorry to say that it will happen again. Sometime, at some point in our investing lives, there will be another crash of 30% or 40% or perhaps more. Crashes happen. Whether the next major crash happens in one day or over the course of several months or longer is anyone’s guess, but it will happen. (I discuss strategies to deal with this eventuality in TSP Investing Strategies.) The most important thing, however, is to be mentally prepared.